I tried Windows 10 a while back, didn’t like it, and uninstalled it. But last week I learned that an Australian version of Cortana (Microsoft’s personal assistant) had recently become available, so I couldn’t resist giving Windows 10 another go. 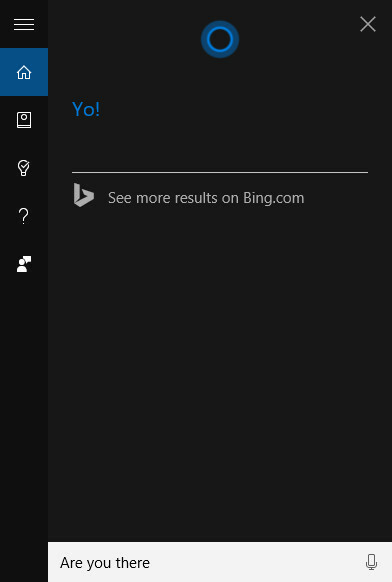 I’m glad I did, because Cortana is lots of fun! Cortana: The answer is 2. Cortana: Well, I’m good with facts. Like I can tell you who the coolest person in the world is. Me: Who is the coolest person in the world? This entry was posted in Software and tagged Cortana, Windows 10 by maruserino. Bookmark the permalink.